The British had burned down our U.S. Capital and the White House. The next step on the agenda of the seemingly all powerful British was an easy sea invasion of the busy port city of Baltimore. I was raised in Baltimore. All I knew about Fort McHenry was it was a historical site were they took kids on school buses for tours. Then it dawned on me. 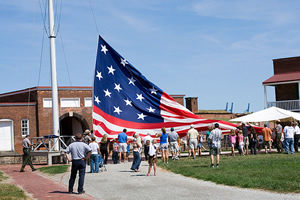 The battle at Fort McHenry is our heritage. It symbolizes who we are as Americans. We tea party patriots are the same as those patriots who defended Fort McHenry.